Bus Route 11 connects Hamilton to St George. Apart from a small section of the route, it’s pretty much the same as Route 10. Buses on this route leave the Central Terminal in Hamilton and head out of the city along Cedar Avenue, passing the WER Joell Tennis Stadium. While buses on Route 10 then head east along Marsh Folly Road, those on Route 11 head straight to the North Shore Road via Blackwatch Pass. After exiting Blackwatch Pass, buses on Route 11 head east along North Shore Road, passing though residential areas in Pembroke, Devonshire, and Smith’s, before arriving at Flatts. The pretty village is home to the Bermuda Aquarium, Museum, and Zoo. After Flatts, the route follows the North Shore Road through Hamilton Parish. Places of interest on the way include Shelly Bay Beach, Crawl Waterfront Park, Clear View, Abbot’s Cliff Park, and the Wilkinson Memorial Park. 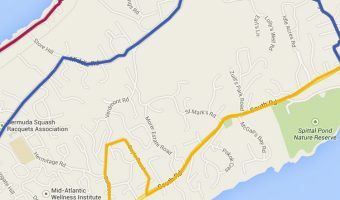 The route then passes then passes through Bailey’s Bay, a small neighbourhood on the western shore of Castle Harbour home to the Swizzle Inn, the Grotto Bay Beach Resort, and Blue Hole Park. After Bailey’s Bay, the next stop is LF Wade International Airport. Visitors should note that, strictly speaking, suitcases are not allowed on buses. You may get a friendly driver who may give you a bit of leeway, but don’t bank on using this route as a means of getting to or from the airport. After leaving the airport, buses head over the Swing Bridge to the historic town of St George. Places to visit here include St Peter’s Church, the Bermuda Perfumery, the Tucker House Museum and the Unfinished Church. From King’s Square, the main square in the centre of the town, you can get a minibus to Tobacco Bay Beach, Achilles Beach, Fort St Catherine and St Catherine’s Beach. Total journey time from Hamilton to St George is 50 minutes. Buses leave every 15 minutes at peak times with the first bus from Hamilton scheduled for 6.45 am. The journey times from Hamilton to the destinations served by this bus route are shown in the table below.